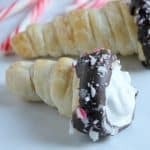 Ok so what I will tell you is that you must make these immediately! They are that good. Really! I am serious. Who likes to eat raw cookie dough? Most everybody who doesn’t worry about getting sick from raw eggs. What is so great about this cookie dough is that this is eggless! Woot! Woot! 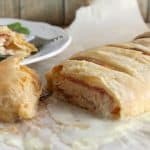 Now are you going to believe me that you must make these immediately? Also I took a short cut and used boxed cake mix. 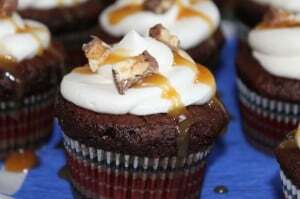 I know that means these are not 100% homemade but it makes the process in getting these cupcakes done fast. ENJOY!!! Vanilla cupcake stuffed with cookie dough topped with brown sugar icing that has you coming back for seconds! Prepare two cookies sheets lined with parchment paper. In a large mixing bowl beat together the butter and sugars together. Beat in milk till batter is smooth. Combine flour and salt. Slowly add the flour mixture into the batter and beat till the mixture is incorporated well. Using two large spoons (about the size of a tablespoon) scoop out some of the dough and roll into tubes. Place on prepared cookie sheets and freeze overnight. Prepare two 12 cup muffin tins with cupcake liners. In large mixing bowl combine cake mix, eggs, oil and water till you have a smooth batter. Then add one frozen cookie dough tube to each cupcakes by pushing it down into the center of the batter. Do not insert the toothpick in the middle because of the cookie dough. In a large mixing bowl, beat the butter and brown sugar together till smooth. Slowly add the powdered sugar till the mixture is smooth. Add in milk and mix till icing is creamy. Pipe onto cooled cupcakes. 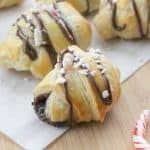 Top with mini chocolate chips and ENJOY!! Want more cupcakes? Here you go! And oh so good! Thanks!!! So cool that there’s frozen cookie dough in these!! They look super delicious!! Thanks so much Ashley !!! Now that is an awesome surprise filling for a cupcake! You can’t go wrong with cookie dough. Pinned! It’s a great surprise! Thanks Julie! 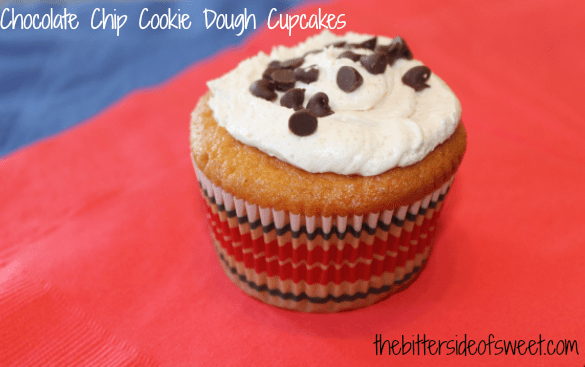 Cookie dough and cupcakes? SOLD! Trish – Mom On Timeout recently posted…Homemade Almond Joy Ice Cream – No Machine Needed! 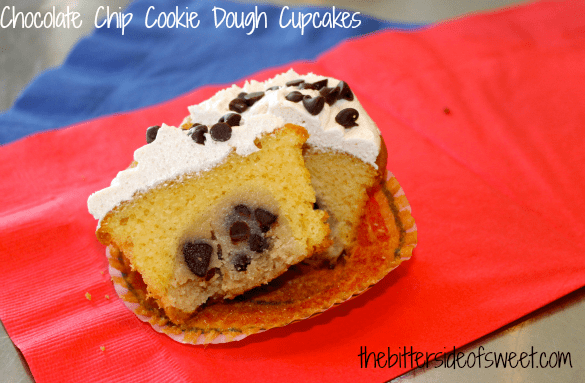 Cookie dough in cupcakes – the best invention everrrrrr! These look so yummy! Thanks Dorothy! 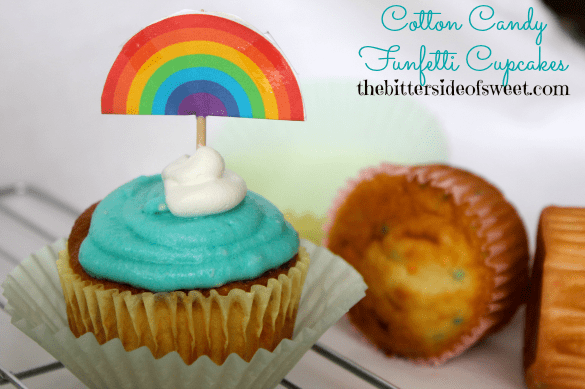 I love things stuffed inside my cupcakes! Oh man, WAAANT these!! They look perfect! Yes I almost always use olive oil! Thanks Gloria! 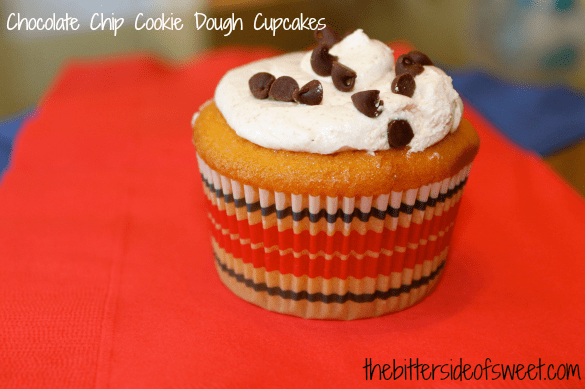 Cupcakes AND cookie dough all in one? Yes, please! 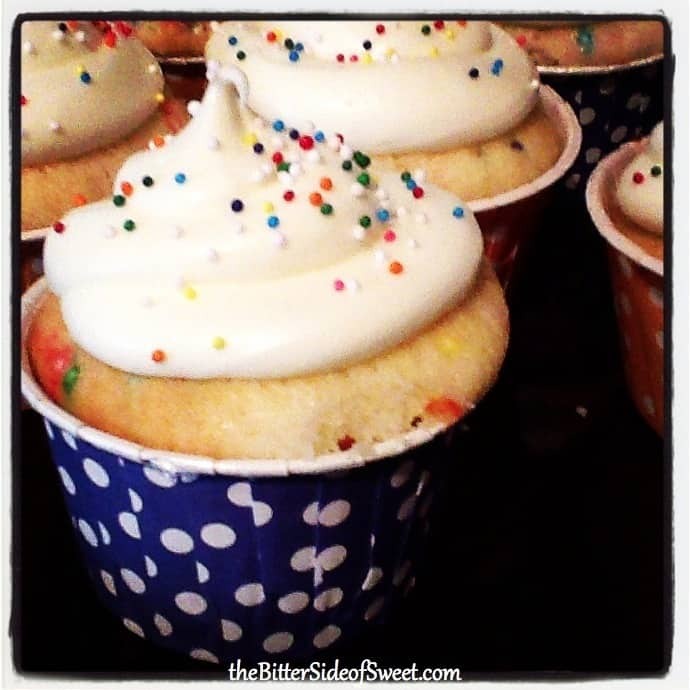 sally @ sallys baking addiction recently posted…12 Things I Love About SUMMER! I heart that little cookie dough ball in the center of the cupcake!! Yum, yum, yum!!! I know, I just want to eat them again and again! OY! I see the 10 pounds I am going to add on real soon!! I would probably have 6 of these cupcakes in one sitting. No joke. I am bad with cookie dough…baaaaad! To the bone! You’re hilarious Kate! I feel that way about cupcakes. I can’t just have one! These look tasty! Thanks for sharing on Two Cup Tuesday. Pinned it! Thanks Karyn! They were delish! I love anything having to do with chocolate chip cookie dough. 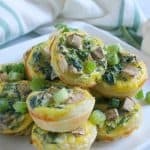 🙂 These look delish! Thanks Tina! I know these are the best!